We first reported about the death of 3 year old Serenity Gandara of Bakersfield, California, nearly two years ago. 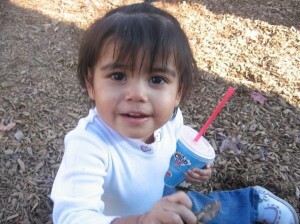 Her foster parents, Alberto and Carla Garcia, were named as suspects in her death and charged with first degree murder. But they were on the run, somewhere in Mexico, so there has been no trial. The US FBI finally caught up with them in Mexico last week and is now working to extradite them to California to stand trial. The Kern County medical examiner has reported that Bakersfield foster child Serenity Gandara, a 3-year-old girl living in the home of relatives, was found dead on the living room floor of the home on July 18, 2010. Blunt-force trauma injuries are named as the cause of death. Grandmothers Maria Garcia and Renee Maese both state that other relatives wanted to care for Serenity and her abandoned brother Isaiah. Isaiah is still alive, but was found with injuries consistent with ongoing physical child abuse. Kern County CPS refused to place the kids with other relatives, preferring to leave them with Albert and Carla Garcia despite child abuse complaints by multiple relatives including both grandmothers. Any child’s death is disturbing. But what is particularly vexing about this case is that Kern County CPS had evidence and warnings from other family members that Serenity and her older brother were in danger. Instead of moving the children to a safer home with capable relatives, they colluded with the foster parents to prevent other family members, such as grandmother Renee Masse, from having access to the kids. That put a stop to the complaints over their care, but is probably also a significant part of why Serenity died and her brother was abandoned in the home with her dead body. In my view, Kern County CPS, some of the social workers, and the US Federal Government should be on trial as co-defendants with Alberto and Carla Garcia for the wrongful death of Serenity Gandara. All too often, CPS agencies rip children out of homes in which they are not in any real danger and place the kids in even worse homes. The social workers and government didn’t inflict the killing blow in this case, but they set up the situation that resulted in the child’s death. Federal Title IV grants reward local governments for these abuses. It’s game of “seize a child, earn your paycheck” in which it doesn’t matter if the child is being hurt, what matters is that “services were provided” so US taxpayers’ funds will be forked over the the local government for reimbursement. The US government has completely failed to institute any effective oversight for abuses by state and local governments that it is funding. As a result, it is blindly financing child abuse and violation of civil and family rights that were significant factors in the death of Serenity Gandara. These problems go back decades, they result in widespread violations of civil rights and deaths of children, and despite that, Uncle Sam has done nothing to solve it. Instead, it just keeps forking over more money to the same abusive government agencies that are the problem. Social workers are given immunity, victims are pummeled to ruin so they can’t sue their abusers in government, and the Feds pay for it. In my view, the US government is funding terrorism against American families that does far more damage to its victims than that caused by the terrorists the Feds have the US military fighting all around the world. I hope that Serenity’s sad ending will help more Americans understand that their government has become a deadly big problem and reform is badly needed. Renee Maese, grandmother of deceased foster child Serenity Gandara, has decided what she can best do to honor her granddaughter’s memory is to fight against the abusive CPS and foster care system in California. Each year, dozens of children die in California foster care homes from child abuse. Serenity was one of these children. Her foster parents, Albert and Carla Garcia, are more than a month later still missing and wanted by police for murder and child endangerment. I will be the first to admit, if it wasn’t for Serenity dying, I probably would be doing my everyday life things, but now I’m advocating for Serenity. Deceased children no longer have a voice, but being her Grandmother, I will speak for her and fight for her justice. The medical examiner has reported that Bakersfield foster child Serenity Gandara, a 3-year-old girl living in the home of relatives, was found dead on the living room floor of the home. Blunt-force trauma injuries are the cause of death. The foster parents, Albert and Carla Garcia, are being sought by the government for murder and felony abandonment. Grandmothers Maria Garcia and Renee Maese both state that other relatives wanted to care for Serenity and her abandoned brother Isaiah. Isaiah is still alive, but was found with injuries appearing to demonstrate a pattern of ongoing physical child abuse. Kern County CPS refused to place the kids with other relatives, preferring to leave them with Albert and Carla Garcia despite child abuse complaints by Maria Garcia. After Maria Garcia complained to the CPS social worker that they ignored her reports, CPS took away another child in her care apparently as retaliation. The child was returned after local media started asking questions. It is common for CPS agencies in the United States to use children as pawns to punish those who question their actions. In Bakersfield, California, family members allege that the dead 3-year-old girl Serenity Julia Gandara and her still-alive 4-year-old brother Isaiah were suspected child abuse victims prior to Serenity’s death. Their 1-year-old sister Juliana wasn’t in the home as she has been staying with other relatives. But CPS showed up to take her away from her aunt and uncle for several hours before they returned her. CPS would not reveal why they took the child. The maternal grandmother, Maria Garcia, suggested that the CPS taking of the 1-year-old baby was in retaliation for her reporting to the media that she had previously complained about child abuse regarding Serenity and Isaiah yet CPS did nothing to protect the children. Meantime, there are serious accusations against Child Protective Services. Serenity’s maternal grandmother, Maria Garcia, said CPS retaliated against her after she criticized a social worker for allegedly ignoring reports that Serenity and her brother, 4-year-old Isaiah, were being abused at their foster home. “You needed to take care of thing when I told you what happened with my kids the other kids. You never listen to me,” Maria Garcia said she told the social worker. The paternal grandmother, Renee Maese, said that other family members wanted to adopt the two kids, but CPS sided with foster parents Albert and Carla Garcia who are now wanted for murder and felony child abandonment and are believed to be in hiding in Mexico. Foster children are often at higher risk for child abuse than kids who live with their biological parents. Today, there is yet another dead foster child with the foster parents on the run from police. On July 18, 2010, a 3-year-old girl named Serenity Julia Gandara was found dead with signs of trauma to her head and torso in the home of her foster parents in Bakersfield, California. Her 4-year-old brother Isaiah was still in the home. The foster parents, Carla Torres Garcia and Alberto Garcia, fled with three other children reportedly born to Carla. Their names and ages are Carlos Joe Solvalvarro, 10, Crystal Garcia, 4, and Alberto Garcia Jr., 4. The children left behind, Alberto’s dead niece and still-living nephew, had been removed by the courts from their mother’s home reportedly due to drug use.